UCLA biochemists have achieved a first in biology: viewing at near-atomic detail the smallest protein ever seen by the technique whose development won its creators the 2017 Nobel Prize in chemistry. That technique, called cryo-electron microscopy, enables scientists to see large biomolecules, such as viruses, in extraordinary detail. Until now, this method has not worked with the thousands of much smaller proteins, which can cause diseases if defective, that are inside cells. A team led by Todd Yeates, a UCLA professor of chemistry and biochemistry, reports results that hold the promise of using cryo-electron microscopy to better understand many important proteins. The research is published in the journal Proceedings of the National Academy of Sciences. "This new method should be useful broadly," said Yeates, who is a member of the Institute for Genomics and Proteomics and the California NanoSystems Institute at UCLA. Yeates' research team published the first research, in 2001, in the scientific field of designing molecular cages built from protein molecules. 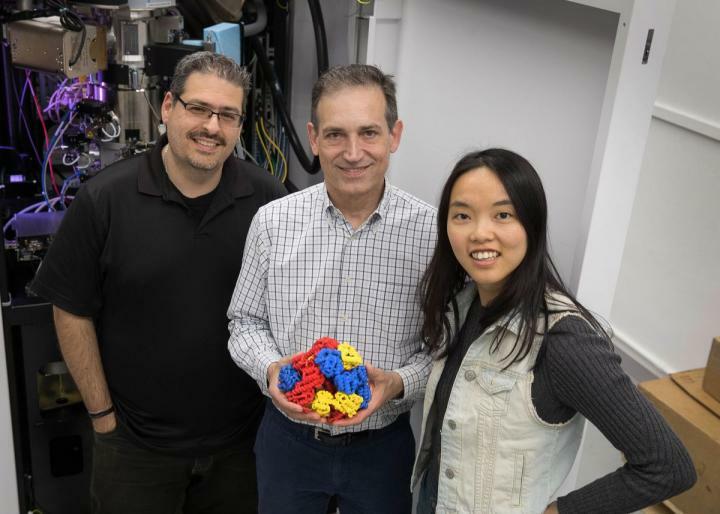 In the new research, his team used "protein engineering" to attach 12 copies of a small protein to a cube-shaped molecular cage, which was designed by a former graduate student of Yeates'. The small protein, called a DARPin, is too small to analyze using cryo-electron microscopy alone. But when the researchers attached the copies to the protein cage, they succeeded in seeing the DARPin with cryo-electron microscopy. A challenge the researchers overcame was getting the copies of the protein to attach in a rigid manner. Their new method, which Yeates calls "scaffolding," can be modified easily to bind to many different proteins as a "universal protein scaffold." "The small protein we attached can itself be made to bind to other proteins, which can then be studied by cryo-electron microscopy," said Yeates, whose research team is currently working on doing this. The development of cryo-electron microscopy earned Jacques Dubochet, Joachim Frank and Richard Henderson the 2017 Nobel Prize in Chemistry. Why is it so important to see a protein in such detail? "The last 50 years of structural biology has been about trying to get detailed pictures of all the parts of the cell to understand them thoroughly," Yeates said. "A picture is worth 1,000 words, and very often, getting a first three-dimensional view of a component of the cell gives you valuable insight — often surprising and unexpected — that you could not anticipate. When you see it, you frequently think, now I see how it does what it does." Many diseases are due to a mutation or defect in a protein. Seeing the defect can provide an understanding of what causes diseases, which can lead to new pharmaceuticals and treatments for diseases. Yeates praised as "spectacular" the research of lead author Yuxi Liu, a UCLA graduate student in his laboratory. Co-authors are Shane Gonen, a postdoctoral scholar at UC San Francisco; and Tamir Gonen, a professor of biological chemistry and physiology at the UCLA David Geffen School of Medicine and a Howard Hughes Medical Institute Investigator. The research is funded by the U.S. Department of Energy Office of Science.